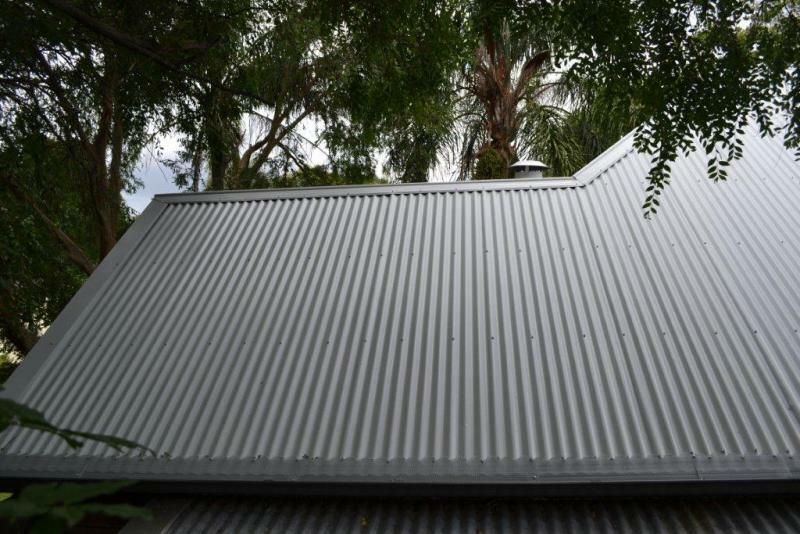 Fibre cement sheeting was a very popular roofing material for a long time in Sydney and all over Australia until it was discovered that it can kill you. For this reason, you really need responsible professionals to remove and dispose of it correctly. When an asbestos roof sheet is broken the tiny invisible fibres are released into the air and can be breathed in or can stick on your clothes and be breathed in a later time by you or someone you love.They can be very difficult to repair (as you cannot break, cut or drill into it) so really, your best option is to replace it with a new Colorbond or Zincalume roof. There are very strict guidelines and even OHS regulations which are enforceable as law that govern how asbestos is to be handled. 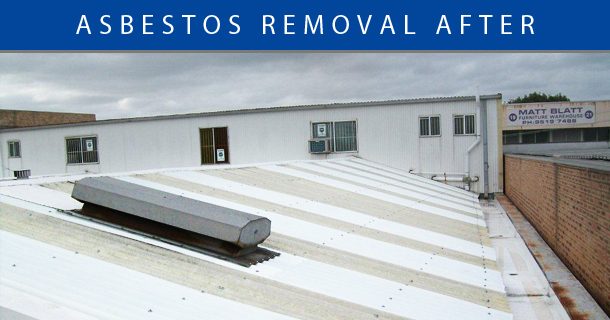 Asbestos removal is certainly something you want done properly and is something that ARS does with complete professionalism.Because the rules regarding Asbestos removal are only getting tougher (making the process even more involved) there has never been a better time to get rid of that old asbestos roof. Initial inspection of roof provides the data needed to apply to remove your roof. Application is made to WorkCover for the removal of your asbestos roof. Once the notification is approved, we then notify all relevant parties in writing of the date that we will be removing asbestos in their area. We prepare Asbestos Removal Control Plans and Safe Work Method Statements to ensure that all OH&S requirements are met for the safe removal of asbestos. On the day of the removal, no one can be on the property. Our team arrives, along with the asbestos bins/trucks for removal and their first job is to put up all the warning signage, barriers and temporary fencing. Next they get kitted up and get to work. The asbestos material is sprayed down with a PVA/Water solution to stop any loose fibres. Asbestos sheeting, etc. once removed must be double-wrapped in 200mu black plastic or placed in bins/trucks lined with these sheeting. Once all of the asbestos has been removed, all frame work is wet wiped to ensure no particles remain. 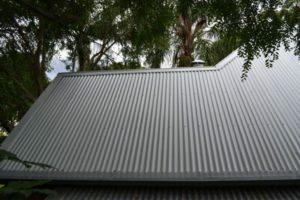 An inspection of the site is then done by a qualified Inspector and once the Clearance Certificate has been granted, we can then go ahead and get the asbestos waste transported to an approved facility (and this is tracked by GPS), and get on with replacing your roof with Colorbond or Zincalume roofing. All of our specialists are trained in the safe removal of asbestos, and we comply with all regulations to do with the safe removal of asbestos. 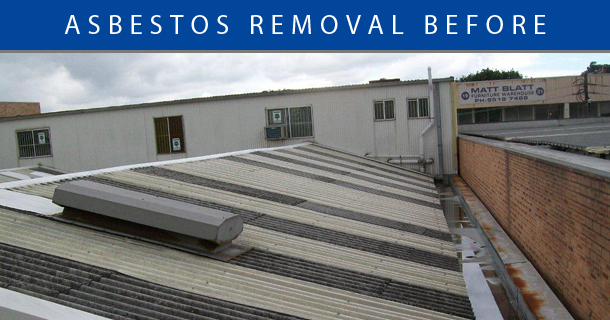 We are licensed by WorkCover to remove asbestos roof sheeting and associated flashings, gutters and downpipes (this is called “Type B Non-Friable Asbestos” i.e. not loose fill asbestos).We follow the rules because we want your home to be a safe environment, and we want you and our workers to be safe as well. Stop worrying about your Asbestos roof and get it replaced. Once it is gone, you will have added value to your property and more importantly made it a much safer place to live or work. Contact us now using the free quote request form.